For the couples who wish for some extra space or small families these spacious one bedroom apartments have a separate sleeping room plus 2 pull out sofa beds or 1 small double sofa bed in the kitchen/lounge area. Cooking facilities including oven, microwave etc. All bathrooms are mosaic tiled walk in shower rooms. Each apartment has its own balcony some a terrace and the views differ from sea, gardens/pool to mountains and village/olive groves. Standard flat screen TV and air conditioning and safe deposit box. 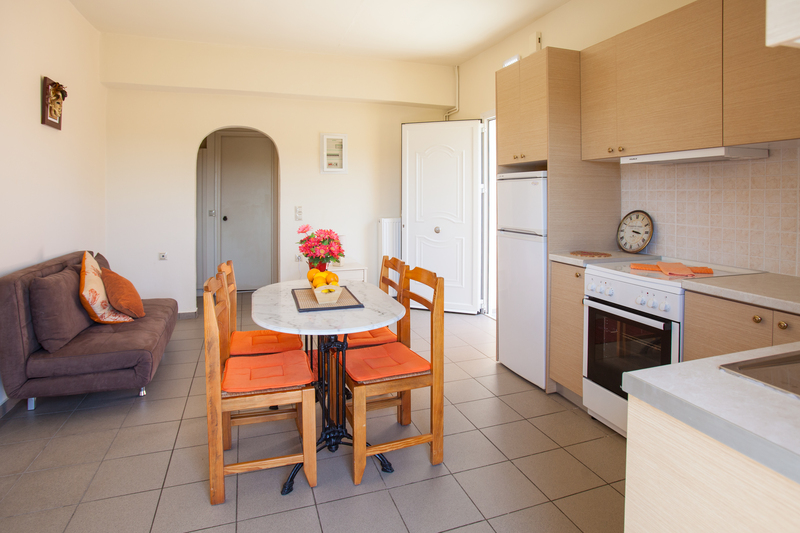 Very spacious well appointed apartments suitable for two couple’s or a family. One bedroom has a double bed and the other twin singles. These suites also have two bathrooms. Plenty of cupboard space and a bathroom each with the mosaic tiled walk in showers. 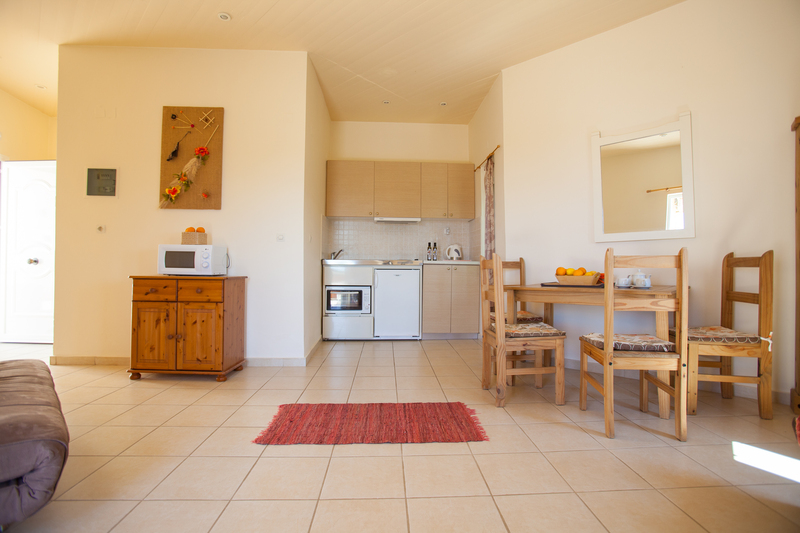 The kitchen has full oven and fridge freezers with microwave and small electrical appliances. Flat screen TV, air conditioning and a safe deposit box are standard. Spacious, well appointed studios sleep two. Renovated in the last few years the studio offers a comfortable sleeping area and compact kitchen facilities which include fridge, two hobs and microwave. A flat screen TV and air conditioning plus a safe deposit box are standard as are the mosaic tiled walls in the shower room. 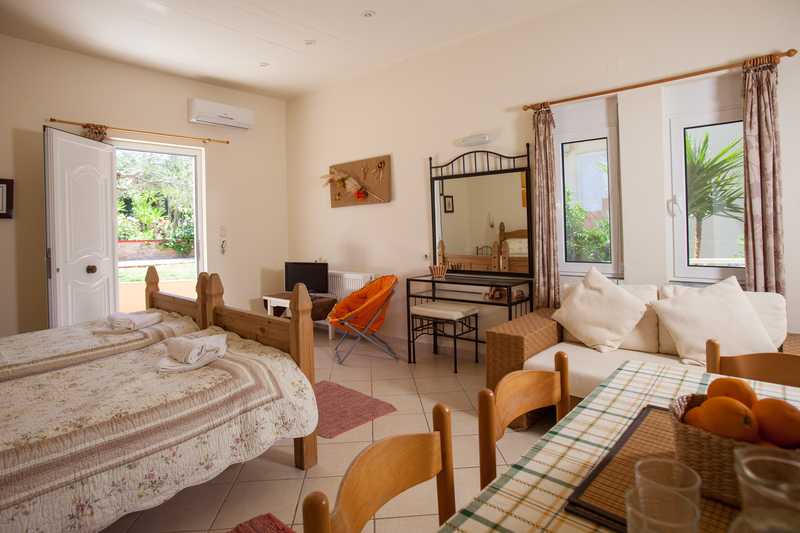 Each studio has a private balcony overlooking the gardens and pool or sea view. One studio is very spacious and has a third bed. The magnificent swimming pool has an enclosed children’s pool and the large sun terrace with sunbeds and umbrellas has spectacular views over Chania and Chania Bay. Pool towels are provided and there is a shady, grassed play area for kids where they can enjoy games such as ping pong and table football. A wide selection of books is available in our library as well as a range of DVDs, maps, local information books and guide books. Our lovely terrace restaurant/bar is open throught the day and evening, we take great pride in the standard of our cooking and use high quality, fresh, local produce, homegrown extra virgin olive oil and a variety of herbs picked freshly from our own garden. We always offer a range of traditional Greek and local Cretan dishes as well as international cuisine. Vegetarian dishes and kids menus are always available, guests with special dietary requirements can easily be catered for. Special themed evenings such as the Cretan BBQ Night are always popular social and culinary experiences. The local, safe, sandy beaches are within 1.5kms and the historical Venetian port of Chania is just 5kms away. We are in easy reach of the Samaria Gorge National Park, the gorge is the longest in Europe and its beautiful surrondings are perfect for walkers, birdwatchers and anyone with an interest in the local Cretan flora and fauna. With a long and varied past spanning at least 6000 years, Western Crete is a paradise for historians and archaeologists. Scuba diving, boat trips,biking, beach visits, tennis and trips into the mountains can all be arranged through New Kydonia. Estimated to be 3000 years old and just a sapling when the court of King Minos was in its heyday at Knossos, stands in the village of Kolymbari. The tree, with its massive, gnarled trunk, was used to provide olive wreathes (or kotinos) to the victors at the 2004 Olympic Games in Athens. A large Minoan tholos tomb of the Postpalatial Period (1380 to 1100BC) can be found near to the German war cemetery. A small sign points towards the tomb which has an unusually long path leading to the burial chamber which is square in plan, and the dromos leading to the entrance is 2m wide and 13.3m long. The tomb was excavated in 1966 and was found looted but excavations in 1966 revealed two seals. ©2014 New Kydonia Suites & Studios. All Rights Reserved.